MGM Grand Vegas Wet Republic - One of the hottest Day Clubs at the MGM Grand Las Vegas. On a recent visit to the MGM Grand Vegas, we spent a day in a cabana by the lazy river pool. While there we saw 2 ambulances pull up to the Wet Republic. That made me wonder what goes on in these new "Day Clubs" in Las Vegas. 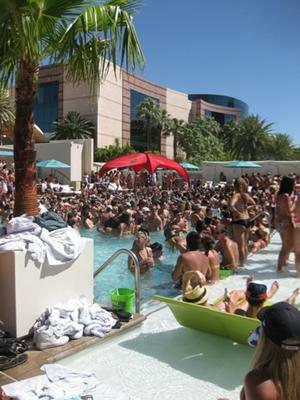 When we first started staying at the MGM Grand, and we went to rent a cabana at the pool, we were offered a regular pool cabana or one at Wet Republic. When asked what it was, we were told that the guests wore postage stamps and dental floss... OK so I guess it is marketed to a younger crowd! 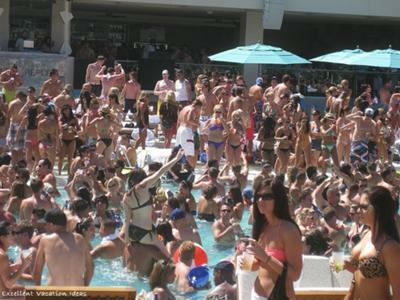 Last summer we spent a day in a cabana at the MGM pool with a couple of 20 somethings and they went over and visited Wet Republic. I was excited to hear about it from them. They said it was one big party, it was like being at a night club in the day. They were even invited into a cabana by a bunch of guys for awhile. 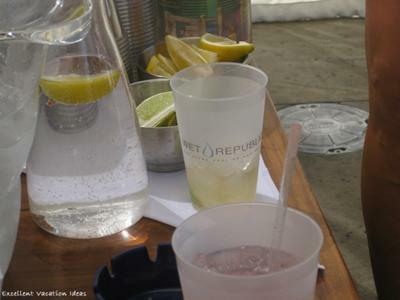 We inquired about rates for entrance into Wet Republic and how much it would be to rent a cabana or day bed. 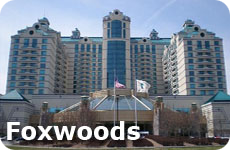 Entrance fees are for females $10 from Monday to Thursday and $20 on Fri/Sat/Sun. Men are $20 in the week and $40 on Fri/Sun and $50 on Saturdays. 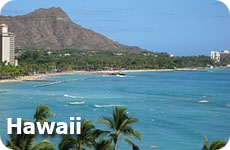 Daybeds and cabanas run from $500 for a daybed on a Friday to $6000 for a bungalow on a Saturday. WOW! that is a lot for a party. So back to why the ambulances were there. Apparently there is one there every day. Someone always over does it. Too much booze, not enough sleep and too much sun. So for Warren and I - not an excellent vacation idea. If it is your thing..you will probably love it!